For over 67 years, Boys & Girls Club of the Big Island (BGCBI) has been at the forefront of youth development. The organization offers a wide variety of programs across Hawaii Island that ensure safe, nurturing and fun environments for our youth, and encourage participation in activities that inspire academic success, healthy lifestyles, and leadership & character building. BGCBI works in support of families and lays foundations that emphasize the promotion of diversity, the teaching of positive values, the importance of education and career exploration, and the opportunities to enhance life skills. All for just $10 per year per participant! As the beneficiary of Ohana Fuels’ “Fuel up. Do good.” program for the fourth quarter of 2018, BGCBI received a donation of $7,879.32. Ohana Fuels is Hawaii Petroleum’s retail fuel brand that provides competitively priced, quality fuels at safe, clean, and convenient locations including eight stations on the island of Maui, and eleven stations on the island of Hawaii. Certified as a TOP TIER™ fuel provider, Ohana Fuels meets the premier standard of gasoline for optimum performance and fuel efficiency. Puna Hawaii – Neighborhood Place of Puna was the most recent beneficiary of the Ohana Fuels ‘Fuel Up. Do Good’ program. 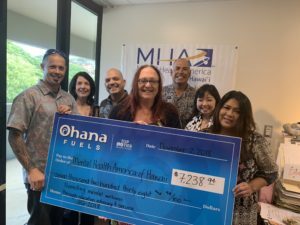 Ohana Fuels partners with nonprofit organizations that serve the needs of the local community, and donates a portion of the proceeds from every gallon of gasoline purchased at Ohana Fuels stations in that community. For the third quarter (July 1st to September 30th) a total of $6,621.81 was donated to Neighborhood Place of Puna. Neighborhood Place of Puna is part of a coalition of non-profits responding the Kilauea eruption. Together, they have housed 133 impacted households, and have provided other support such as emergency airfare, financial assistance, and crisis counseling to individuals and families directly affected by the eruption. “No single organization or agency can do it all! We are better and more effective when we work together. 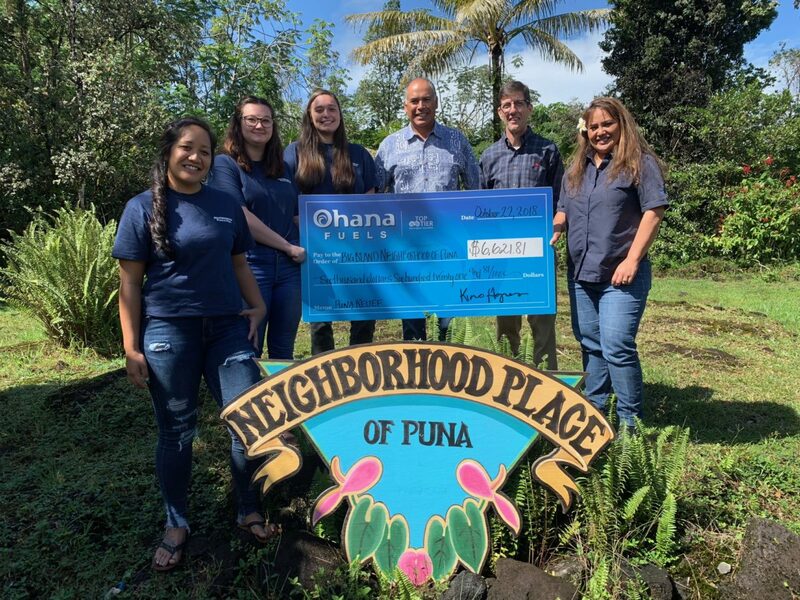 This donation from Ohana Fuels will help us – Neighborhood Place of Puna – continue to do our part in helping those whose lives have been turned upside down by the Kilauea eruption,” said Paul Norman, Executive Director of Neighborhood Place of Puna. Photo caption, From Left to right: Kimo Haynes, President of Hawaii Petroleum; Paul Normann, Executive Director of Neighborhood Place of Puna; Sha’nae Ramos, Neighborhood Place of Puna; Joy Madriaga, Hawaii Petroleum. 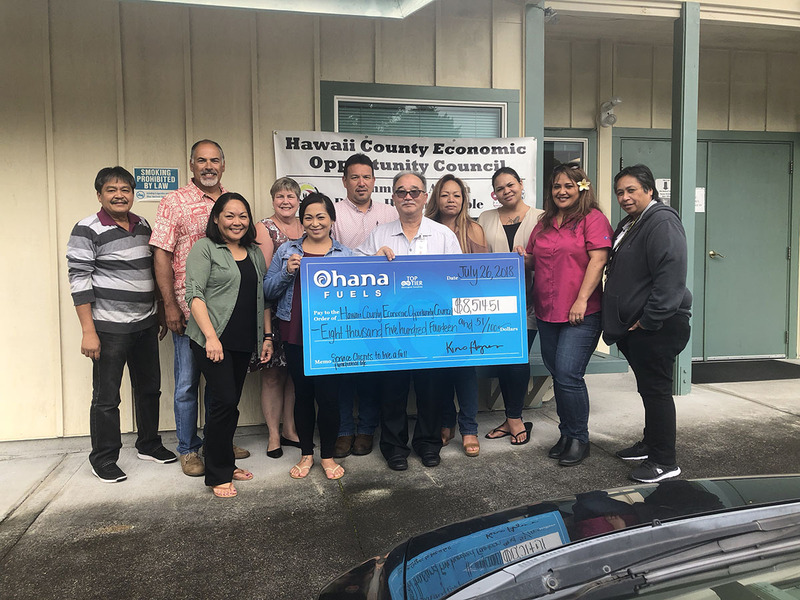 Hilo, Hawaii – On July 26, 2018, the Hawaii County Economic Opportunity Council (HCEOC) became the most recent beneficiary of the Ohana Fuels ‘Fuel Up. Do Good.’ program. 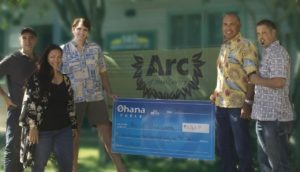 Ohana Fuels partners with nonprofit organizations that serve the needs of the local community, and donates a portion of the proceeds from every gallon of gasoline purchased at Ohana Fuels stations in that community. Second quarter sales resulted in a donation to the Hawaii County Economic Opportunity Council in the amount of $8,514.51. HCEOC is a Community Action Agency established in 1965 that strives to alleviate the symptoms of poverty and assist the most vulnerable in our community. The agency works through many programs including the Senior Farmers Market Coupon program, the Low income Housing Energy Assistance Program, and the Weatherization Assistance Program. In addition, they also provide transportation for handicapped, low-income, and senior clients, meals for students, housing preservation grants and education programs. 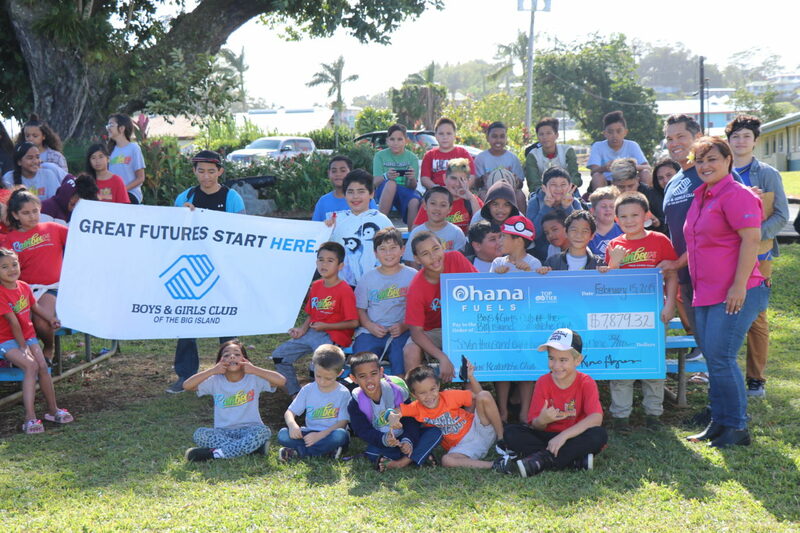 Honoka’a, Hawaii – Brantley Center was the most recent beneficiary of the Ohana Fuels ‘Fuel Up. Do Good.’ community giving program. 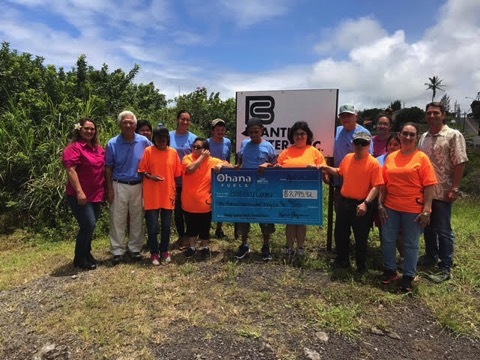 Ohana Fuels partners with nonprofit organizations that serve the needs of the local community, and donates a portion of the proceeds from every gallon of gasoline and diesel purchased at Ohana Fuels stations in that community. The donation made to Brantley Center from first quarter sales at Big Island Ohana Fuels locations was $ 8,795.92. Copyright © 2019 Ohana Fuels. All Rights Reserved.